If playing online slots in the casino is your thing, then Silversands is the right casino for you. They have a huge variety of slot games to choose from including 5 Reel, 3 Reel, Bonus rounds and Progressive slots with huge jackpots. The image on the right is a screenshot of the actual casino slots interface. The video below is a demo of the Silversands Casino slots area. In this video we show easy the slots interface is to use and we demonstrate two games, the Aztec Millions with the slots feature guarantee (which is triggered during the demo) and Ghost Ship, one of the latest Silversands Casino slots games. Ghost Ship did not have a feature guarantee, but during the demo, the feature was triggered. This is a very exciting new slots game. All the games are fun to play and easy to understand. When you click on the game name, full information is provided about the game in the main screen. If you decide to play that game, simply click on the Play button. During game play, its easy to increase or decrease the value of each line bet or the number of selected lines in play. The slots Feature Guarantee is a firm favourite with all slots players. When you select games with this feature, it means you no longer have to wait and hope for free spins or the bonus to be triggered. The slots Feature Guarantee means just that, you are guarantee to get the game feature during a predetermined number of spins. Knowing that feature is definitely coming, makes for a thrilling slots experience! Slot machines are the most popular of all casino games, and the simplest to play. To play, just put money in the machine and either pull the handle with the mouse, or press the Spin button. On real series slot games select the lines you wish you to play (up to 25 lines per game). There is also an “autoplay” function for these games. Full tutorials are available on all games. Support is available 24.7 whether you have a general enquiry or are in need of first class technical support. You never get bored playing casino slots online as new games are always being introduced. And usually when new slots games are launched, they are often accompanied by a special promotion for that slots game only for a specific duration during the launch period. Play Free Slots in the Casino, or Play for Real Money! Sometimes its a very good idea to try free slots first and see how you much you enjoy the game. There are so many different slots games available, all with different rules, payouts and of course entertainment value. Playing free slots is an ideal way to practice and find your ideal and preferred casino slot game. At a later time, if you were looking for free slots initially, and you feel lucky, you can always switch to real money – it’s entirely up to you. You can play slots for free all the time, or play for real money – no pressure – the choice is always yours. Choose REAL if you want to play the Silversands casino and win real money or choose PRACTICE MODE if you simply want to get a better feel for the games before you decide to play for real. Remember, when you need to make a deposit, simply visit the cashier for both fun and real play casino games. Practice Mode is an excellent choice whilst experimenting with a new slots game that you have not previously played before. All you need to do to play Silversands Casino free slots, is to download the free casino software. This is quick and easy and will be done in a matter of minutes. Once the software has been downloaded you can begin playing immediately. It’s absolutely free, no credit card needed, no cash deposits – it’s all about the fun. 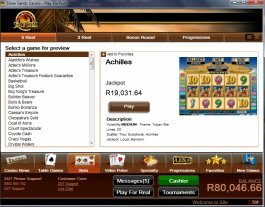 The free casino software also has Table games available like Blackjack or Roulette and if you want to try your hand at these, they are also available for both free play or real money. Play any of the available games in the free practice mode so you may gain a feel for the games and experience the realism without making a cash deposit. To top up your account balance simply visit the cashier and add free virtual funds to your account or switch to playing for real money if you prefer. The Silversands software is easy to use and offers clear information about all the casino games available with specific information on each of their slots games. There is so much to choose from and whilst playing free slots in the comfort of your home you will enjoy the casino experience absolutely free. All the graphics are high quality and the sound that accompanies each game is different and ads to the overall slots game enjoyment. All games can be played for real money in various currencies or for free just for the enjoyment of it! So if you’ve been thinking about joining an online casino to play slots, give Silversands Casino a try and start playing at the best of the best online now!